Blue Sky Smog Star Certified Station - We Are Official STAR Certified Smog & Test Only Center. We perform smog tests for all DMV purposes such as: STAR Certified Smog Checks, Regular Smog Checks, Gross Polluter, Out Of State, Change Of Ownership and DMV Required Test Only. We Also Specialize In Exotic and German Cars, Limousines, Heavy Duty Trucks and Motorhomes/Rvs. We Are Official STAR Certified Smog & Test Only Center. We Also Specialize In Exotic and German Cars, Limousines, Heavy Duty Trucks and Motorhomes/Rvs. What is a Smog Test Only Center? What's a Test Only Center? What is the difference? What is the difference with a regular smog station and a STAR Certified station / Test Only? You received your renewal notice and discovered it's asking for a smog inspection at a STAR Station / Test Only. No need to panic. All this means is that the DMV has chosen your car to be inspected at a special Star Certified, Test Only smog station. Star Certified Stations bring the highest quality & trusted smog checks using state-of-the-art equiment. A Smog Test Only center, as the name suggests, can only smog test vehicles and is not allowed to perform automotive repairs. 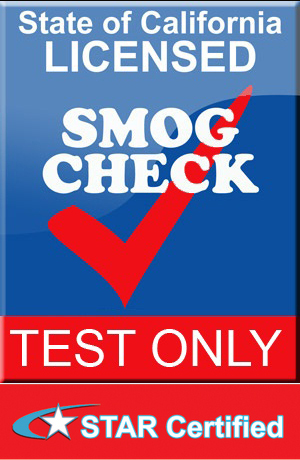 A test only smog check center has an obligation to insure a non-biased smog test inspection. They can not perform repairs. If your vehicle has been selected to undergo a Test Only smog check don't be alarmed. Simply locate a convenient smog test only center and proceed with the inspection. The smog technician conducting the test can inform you of any serious issues. There are several Smog Test Only Centers throughout California and you can find one in your area using our. Important Note If your vehicle fails at a Test Only Smog Check center, you will need to seek repairs at a Test and Repair station. The Test and Repair smog station will need to conduct a new smog test - called a Baseline Test, and may charge you a smog inspection fee as part of their diagnosis and/or repairs. Also note that a smog test only station is not allowed to perform or comment on any diagnosis or possible required repairs. Per California State law their primary obligation is to conduct a fair and unbiased smog test. All and any repairs must be performed by a licensed smog check repair station, or the vehicle's owner personally. The California Smog Check program and California's emission laws are designed to identify vehicles, which are polluters through the use of a state of the art exhaust gas analyzer. The exhaust analyzer is much like a photo camera except it takes pictures of your vehicle's exhaust (rather then your vehicle) and translates that into information which a Smog technician can read/understand and evaluate. Based on this information the technician can diagnose your vehicle's engine condition. Smog Check Question? Ask-A-Tech. Get Expert Answers. Have a smog check question or concern? Need an honest answer? We have ASE certified smog technicians on staff, here to assist you with any smog check concern you might have. We offer non-bias and expert support to California vehicle owners in need of smog test and vehicle registration assistance. Clean Comfortable Waiting Area, Mention This Ad For $10.00 Off. Copyright 2010 Blue Sky Smog & Test Only. All rights reserved.